In this age of divisive politics and as we head into the midterm elections, I often feel that as an individual there is little I can do to make a positive difference in the world. Staying informed and voting is, of course, the most crucial action we can all take. But beyond that and more directly, I believe steadfastly in the power of volunteering to help transform both ourselves and the world around us. USITT is an organization based on the philosophy of volunteerism at all levels. Our annual Conference, the TD&T journal, newsletters, commissions, programming, and even the leadership of the Institute all depend upon individuals sharing their time and talents for the benefit of us all. Volunteering takes us outside of our own concerns and through the sharing of our own gifts empowers us to improve our industry, gain new skills, and expand our network of friends and colleagues. I began a lifetime of volunteer work right here at USITT. I was introduced to the Institute as a broke college student. It was my introduction to the national theater scene and it gave me connections that helped chart the course of my professional career. At the time, volunteering my time was what I could offer in return. I discovered how much I enjoyed the exchange of ideas and knowledge with associates from around the country. My early experience with USITT lead me to volunteer at other organizations that center around my professional life like the Entertainment Services and Technology Association (ESTA) and The Entertainment Technology Certification Program (ETCP). For ESTA, I help to write rigging and stage machinery standards. For ETCP, I help to write the Rigging Standards Exam for Theatre Riggers. I work with Underwriters Laboratory (UL) on writing testing standards and National Fire Protection Association, NFPA on writing Fire Curtain Standards. All of these experiences have expanded my knowledge base, exposed me to new ideas and technologies, and provided the gift of new friends and colleagues. I have such admiration for those in our profession who are giving back and helping move the theater industry forward particularly in the area of safety. My volunteer work with ESTA, ETCP, and NFPA standards has demonstrated for me the integral role that volunteers play in keeping us all safe. Individuals from different areas of our profession come together to determine the best practices and design for everything from rigging systems to fire curtains and beyond. We all benefit from the work of these volunteers. Volunteering also allows you to acquire new skills and knowledge and expand your comfort zone. You will be amazed at what you can learn and improve upon with the help of others. Whether it is researching and writing an article, participating in a panel discussion, or contributing to a commission you will stretch yourself and develop skills that will benefit you in your career. And by volunteering, you are also able to share your own gifts and talents with others. There is no greater joy for me than to share what I’ve learned with others and help them to advance their own careers … making us as a community a better place to live and work. One of the greatest benefits of volunteering is developing your professional network. These people are your safety net, your friends, and your colleagues. I have learned from them many different solutions and approaches to problem solving that have made my daily work life easier. I have been supported by so many in my network as I’ve looked at job opportunities and career shifts. And I have a large and varied group of colleagues to use as a sounding board or make inquiries of as I navigate my own job. A broad and varied network of professional colleagues is integral to a life in technical theater. And volunteering is one of the best ways to create and expand that network. For me, USITT is like family. I grew up here. We help each other because that is what families do. 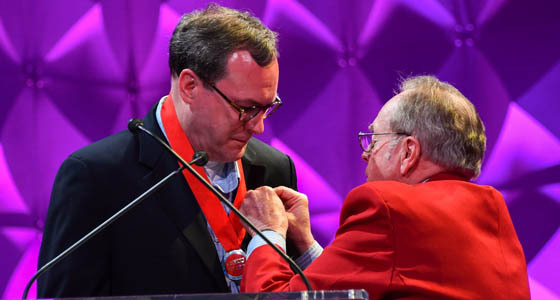 And without volunteers, USITT would not exist as we know it. I am always so very gratified and feel a strong sense of accomplishment when I attend the conference and experience the camaraderie and excitement of the gathering. And I am gratified that in some small way, along with hundreds of other volunteers, we made it happen. 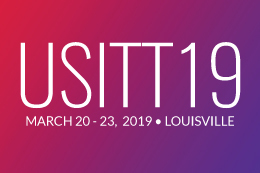 That is the joy of volunteering my time for USITT. Get out and volunteer. Whether it be with USITT or your local community, church, or school, share your experience and knowledge with others. Make a difference.